With a great deal of pomp and circumstance, MLS unveiled its 2019 schedule yesterday afternoon. While we already knew the Union’s first two matches — a home opener with Toronto and a road dance with Sporting Kansas City — the announcement filled in the other 32 spots on the calendar. Projecting results halfway through the offseason onto a plain list of fixtures is certainly a fool’s errand, as resident snarky Twitter hero Matt De George observed yesterday. While this might prove to be the most accurate prognostication, there are some things we can conclude from the schedule. What parts of the season will be a slog? How will international competition affect the Union? What road games are worth investigating? A tough start. It isn’t exactly a favorable first five fixtures for Philadelphia. The Union haven’t beaten Toronto in their last seven matchups (0-5-2), including a playoff defeat, while Sporting had the best record in the West last season. Next, the Union are on the road in Atlanta, taking on the defending champions. Games at home versus the always-tedious Columbus Crew and away against expansion squad FC Cincinnati round out a difficult March. The Union stumbled out of the blocks in both 2017 and 2018, putting them in a tough position even as they heated up over the summer months. Another tough start will do little to earn the trust of a skeptical fan base. A compressed regular season. Thanks to an even number of teams in the league and an earlier start to the playoffs, this year’s MLS schedule features a logical format and fewer bye weeks. The Union play each team in the East twice and each team in the West once. Not counting the short Gold Cup break in June, the Union only go one weekend without playing (September 6/7) once the season starts. The Union will also play six midweek fixtures, which is the same number as last year (not including U.S. Open Cup matches) but without as many bye weeks. With everything a touch more condensed, there may be more opportunities for the Union’s depth players to make an impression. Summer blues. A particularly brutal stretch of the season arrives right after the Gold Cup. The Union play four games in eleven days, starting with a three-game road stretch against New England, NYCFC, and Orlando City before facing Orlando again at home. The Union then play three of their next four on the road. All told, it’s six of eight away from home, and the club will only have two home games between June 8 and August 11. Getting a few results in that run could make or break the season. Down the stretch. The schedule gods haven’t been particularly kind to the Union at the end of the year, either. The final six games see Philadelphia play host to Atlanta and LAFC, then a road trip of three games in eight days where the midweek match is a cross-country trek to San Jose. That’s brutal travel at the end of a long season. NYCFC comes to town on the last day of the season, which could stir unpleasant memories of the end of the 2018 campaign. Speaking of the Gold Cup… This year’s tournament runs from June 15 through July 7. Assuming that the competing nations pull their players a week before the tournament starts, that span covers five MLS matches, all of which are against Eastern Conference opponents. Andre Blake is the only certain call-up, with Cory Burke, Alejandro Bedoya, Auston Trusty, Mark McKenzie, and Fafa Picault all on the fringes of their national teams. McKenzie and presumptive left back starter Matt Real could miss as many as five matches before the Gold Cup on duty at the U-20 World Cup. Ernst Tanner will likely search for a veteran GK backup and another option at left back this offseason to cover what could be key holes in the middle of the season. Where should you go? As PSP’s resident westerner, I look at the schedule every year to see what fun road trips the club will be making. One clear highlight looks to be the June 2 match against Minnesota, who are opening what looks to be a jewel of a stadium this year in Allianz Field. The city should have thawed out by June, and if there’s one thing Minnesotans love it’s sports fans from Philadelphia. If you’re looking for a west coast jaunt, there are April trips to Vancouver and Los Angeles on the schedule. And — of course — there are the yearly trips to the Bronx (June 29), Washington (August 4), and Harrison (September 22) to mark on your calendar. Hmmm…tough start, rough middle, brutal finish. When do playoff tix go on sale? As I read this, the Union have a tough start to the schedule, a rough middle, and brutal finish. You aren’t wrong. April and May are pretty favorable, though, and they’re quite dense with matches. My instinct is that the Union will want to be in playoff position at the Gold Cup break, which comes exactly 17 matches into the season, to feel confident about their final positioning. Hope he jams it to Curtin and Ernst. They need to be shown that when you make bad personnel decisions you pay for them. This move was pure stupidity based upon Money. Elvado, move was best for both a team under Curtin and for KR. Curtin doesn’t help KR improve and gets opportunity to shape (or ruin or both) another young defensive prospect. I wish KR well, and that he gets to be more creative and don’t mind if he scores against union. I also liked seeing Hunter pence and Utley when they came to philly. Still cheering for union so no different==can root for last players and home team. Question–with Steel playing any overlap for doubleheader promotion? If so, they should make Union first game due to first_team players complaints about field conditions after other events prior to mls matches last year. 1. in case you were distracted by holidays, they’ve laid new sod on the pitch. 2. so far, i.e., earlier this afternoon, there was no word on the six direct conflicts, where both teams are home on the same day. they reiterated today that they want two games in the Lehigh Valley this season, and I was told they are “making progress.” but there was no concrete detail offered. logic says a conflict game could be moved north, but there is not one scintilla of evidence supporting it. The new sod should address the existing problems, but (potential) heavy use certainly opens them up to similar damage recurring. They surely need to manage events with an eye toward preserving field conditions. Robby o on point about sod. By July back to same issues. No one will notice. But Chicago probably would kick your buttons. I did wear a Phil’s jersey and hat to a cubs sports bar as phillies decimated the cubs and the bar patrons bought me drink after drink for every run scored. But cubs fans are nice like that. who cares about the schedule. 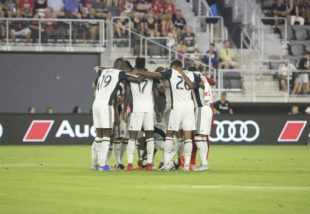 this team will not progress unless they get a new owner or partner who will let the new director sign an acm as talented as Doakal or Barnetta, a younger version of Ilsinio, a defender who has experience and skills to pull the back line together and a new coach with a winning history at mls level or higher. until that happens this team will never meet its full potential and dwell in perpetuak mediocrity. This is, frankly, ridiculous. For any team. There is absolutely no reason at all for MLS to do this to a team. Damn straight. Play san Jose in February or march. How difficult is this for mls to figure out….Play late February and March in warmer climates, spread season out. From my perspective, the issue is the cross-country flight for a mid-week game that’s the middle part of a “3 games in 8 days” scenario. Basically, my argument is that if MLS is going to make the schedule in such a way as to effectively require mid-week games like this, then all three games within that week should be in the same time zone. That could mean the Union travel to (for example) Montreal, NY, and Orlando; or it could mean they have 3 West Coast games (say San Jose, LAG, and Seattle) and they just go out there for the week somewhere. Nobody should have a situation where they need to take a cross-country flight as the middle game of the 3-in-8 scenario — and, really, for me it’d be best if none of the three games involved a cross-country flight. One other thing I’ll point out is that, even though this is not optimal for the Union, travel is *much* more difficult for Western Conference teams. Think about the Rapids, who are at least an 8 hour drive from their nearest opponent, RSL. The Union have at least seven opponents within that radius (DC, NYC, NYRB, COL, NE, TOR, and MTL).